A day of Supply Chain innovation with Westernacher and SAP. Thanks to all who attended our Digital Supply Chain Roundtable organized with SAP! Today’s businesses are navigating dynamic waters, customer demands and market volatility are increasing, product lifecycles and expected lead times are decreasing. This is further complicated by technology introducing new players at an accelerating pace. To stay relevant in such an environment, supply chains must be nimble to react to short term changes, informed to predict market demand and integrated to deliver on customers’ expectations. 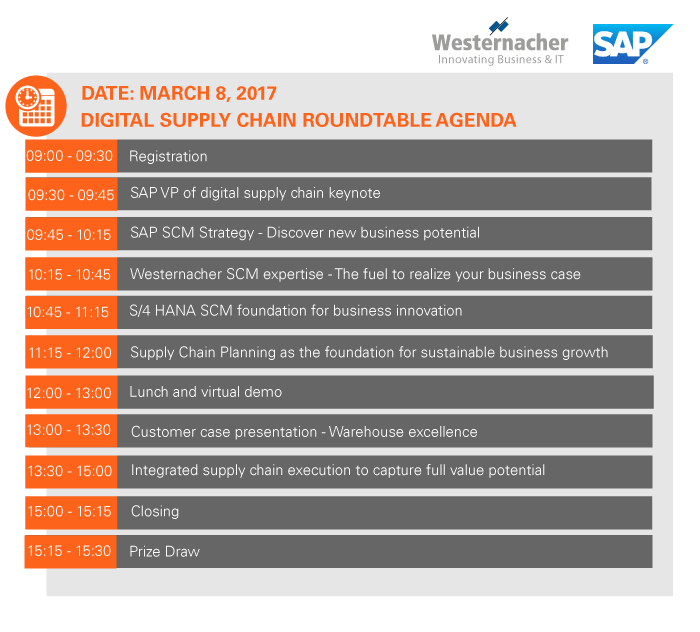 Westernacher and SAP held a roundtable on March 8 on the latest innovations available to supply chain professionals, who could learn from customers’ successes and interact with their peers. As long-standing Supply Chain experts and one of SAP’s preferred partners we provide global Business and SAP consultation and implement developed strategies, in cooperation with our customers. They benefit from our long-term process and SAP expertise in specific topics and industries such as automotive, manufacturing, logistics services, retail, wholesale, consumer goods, life sciences, utilities and telecommunication.